All of the kids on the baseball team, including Dr. Scott Coletti, DC, got adjusted and looked up to the chiropractor. This experience gave him a firm foundation of chiropractic care and intrigued him to learn more. Growing up with a mentality of healing naturally, Dr. Coletti, DC rarely took medications. He believed that when it came to health, less was more. This philosophy aligned with chiropractic care as a means of natural healing without the use of drugs or surgery. Once he graduated with his undergraduate degree, he called a friend who was a few years older that was in chiropractic college. After talking to him, he gravitated toward chiropractic college and hasn’t looked back since. Dr. Coletti, DC chose to attend Life University in Marietta, GA. He still remembers a time during his residency in Marietta when he was delivering newspapers early in the morning. One customer had a 9 year old daughter who wasn’t able to control her bladder, had to wear diapers and had been to every physician or specialist they could think of. Dr. Coletti, DC recommended that she and her daughter visit him for care. They arrived, desperate for anything to help. After just three adjustments, he was able to align the girl’s spine and lower back that helped her regain control of her nerves. 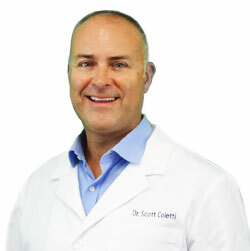 Dr. Coletti has been helping patients get out of pain with cold laser for over five years and so successfully, he alongside his ATC Brad of almost 20 years, have come up with Trademarked Protocols to successfully get people out of pain while regenerating the tissue in painful and degenerative joints. They are now helping other physicians world-wide with their Cold Laser Protocols. Dr. Coletti, DC is an avid golfer and is passionate about personal development books. As a strong Catholic, faith is extraordinarily important to him. With one daughter and three sons, he stays busy coaching his children’s Little League and flag football teams. If you’re wondering how Dr. Coletti, DC can help you feel better, contact us today.